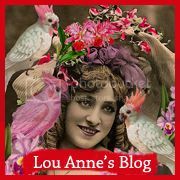 The Fanciful Magpie: Pittsburgh's Going to the Super Bowl! 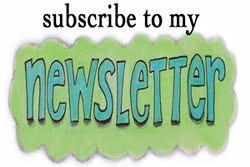 In case you are wondering what the splashy yellow dish towel at the top of my sidebar is, let me elaborate. 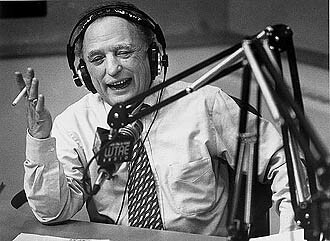 Anyone from Pittsburgh would recognize it in an instant, and maybe even fans of other football teams besides the Steelers would know it's Myron Cope's Terrible Towel. He is much beloved by Pittsburghers, who mourned his death in 2008. In 1987, he was named by the Hearst Corporation as a noted literary achiever, along with Mark Twain, Jack London, Frederic Remington, Walter Winchell, and Sidney Sheldon. At its 50th Anniversary, Sports Illustrated selected Cope’s profile of Howard Cosell as one of the 50 best written works ever published in the magazine. 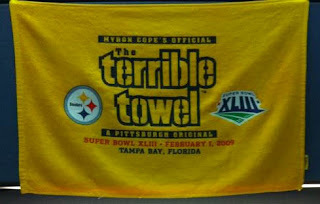 So what's with the Terrible Towel? 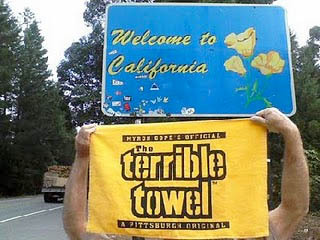 And so the Terrible Towel was born. of any major pro sports team. 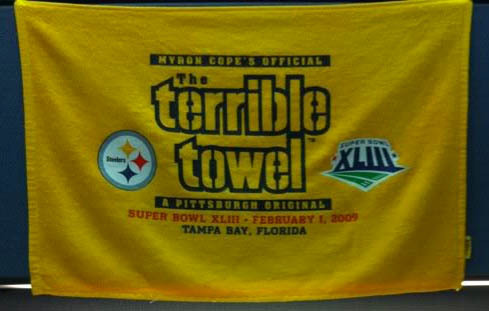 In 1996, Cope gave the rights to The Terrible Towel to the Allegheny Valley School in Coraopolis, Pennsylvania. The school provides care for more than 900 people with mental retardation and physical disabilities, including Cope's autistic son. 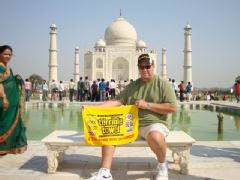 Proceeds from the Terrible Towel have helped raise $3 million for the school. 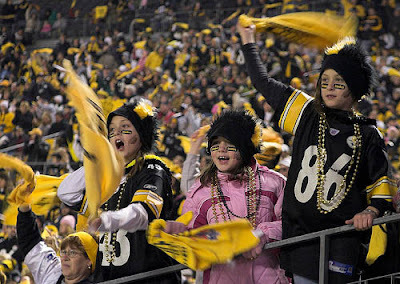 When the Steelers won the playoff game against the Jets on Sunday night, thus advancing to the Super Bowl, plenty of people give credit to the thousands of fans in the stadium waving their Terrible Towels. Alright, on to the travels of the Terrible Towel. Talk about being a dweeb. 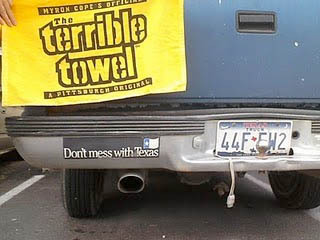 I'd never heard of the Terrible Towel or Myron Cope. Seems lots of people from around the world have, though. 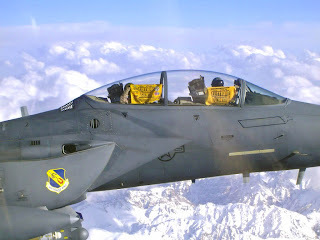 Love this FUN post and I hope your Steelers win. 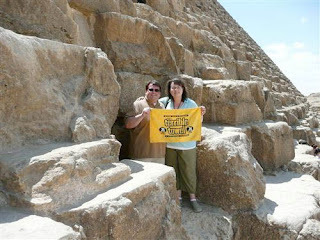 Funny story: QuadGraphics in Wisconsin is printing up those Terrible Towels for the Super Bowl! 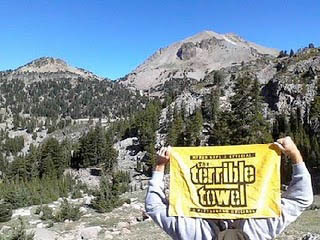 I'm glad we're playing the Steelers, though, they're a hard-working grinder of a team just like our Packers. Respect to you! 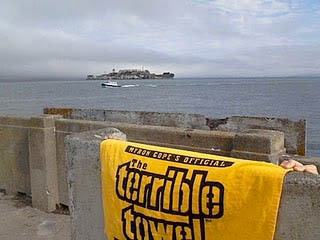 I've got my terrible towel ready...cheering from WA now though! 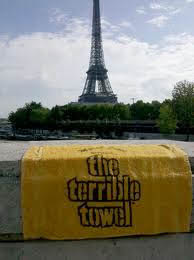 I love these pics of the towels travels!! ha!